The Rogue from Dragon Alliance offers medium-fit sizing and adjustable hinges on the strap to guarantee a perfect goggle-to-helmet interface and solid, hassle-free function. Tribe Red with Ionized + Dark Smoke Lens. 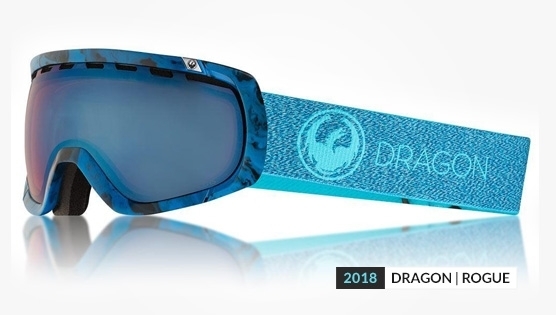 The Rogue from Dragon is designed for medium to large sized faces and even if you don’t wear a helmet, the Rogue’s optically correct spherical lens with Super Anti-Fog coating will give you a crystal clear view of the terrain in all kinds of conditions. With model options that include Transitions® lenses that automatically change tints in response to changing sunlight and weather conditions, eliminating the need to swap goggles or change lenses or Lumalens, a colour optimized lens technology offering ultra high-definition optics across the entire spectrum of light conditions, then your options are almost as long as the choices of slopes to hit next.